Pomms Ear Plugs are ideal to use in horses who are affected by noise or environment, whether it be whilst competing, racing, hacking out or during fireworks displays. They are made from a comfortable, soft, non-irritating material & are easy to place in the ear canal for a secure, comfy fit. 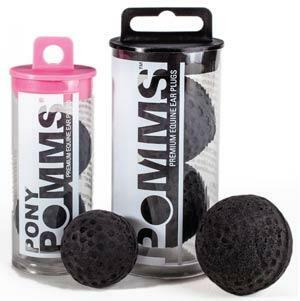 Pony Pomms are 3cm in diameter & should be used in ponies under 14hh. Horse Pomms are 4cm in diameter & should be used in horses over than 14hh.